On the New Year’s Day, I reached home at about 2245. After reaching home I got busy with cleaning and unpacking my backpack. Before going to bed I checked my phone. Prasad informed that we could go to Raireshwar next day. I slept like a baby that night. In less than 24 hours, I was to go for another exciting trek. During the day, I shopped for food and packed again. Sagar came to pick me at 2000. At about 2045 we took a tea break near Khed Shivapur Toll Naka while waiting for Prasad. 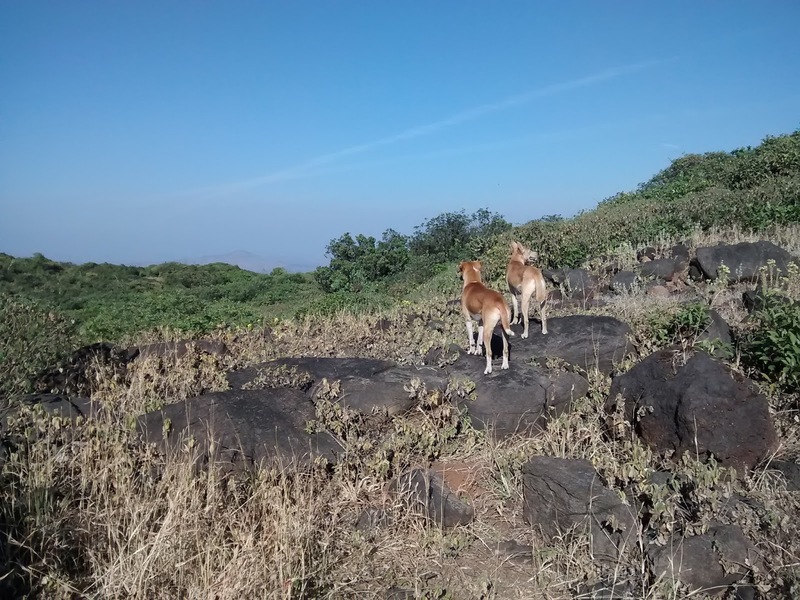 At Bhor, we took another break and then zoomed off to Raireshwar. The road was still the same! Once at the Raireshwar Plateau, we decided not to disturb the civilization and pitched the tents midway near a waterhole. It was exact 0030 when we pitched the tent and started cooking maggi as midnight meal. Hot soupy maggi! Yummy!! I had not even entered the sleeping bag and Prasad was already snoring. His snores made me feel safe in the wilderness. At 600 Sagar was already up and was trying to wake up Prasad and me. 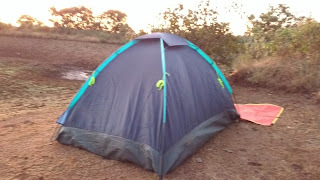 After a lot of efforts, I managed my way out of tent at about 645. We quickly wound up the camp and headed to Mama’s place. Mami again cooked Pohe and tea for us, and at 830 we were out in pursuit of Nakhind. This time two doggies started following us. And later i.e. 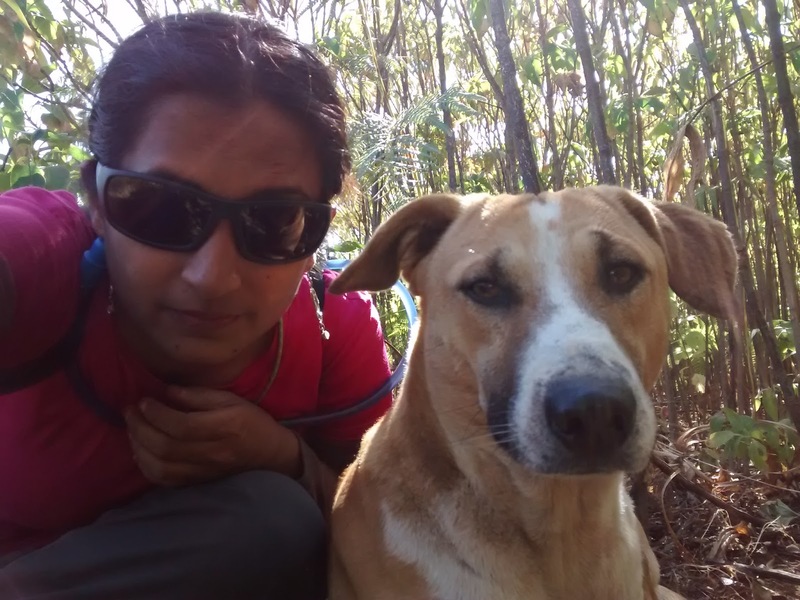 while drafting this blog I realized that one of them was our companion last time. Sagar was leading; Prasad had put on GPS tracking for us. 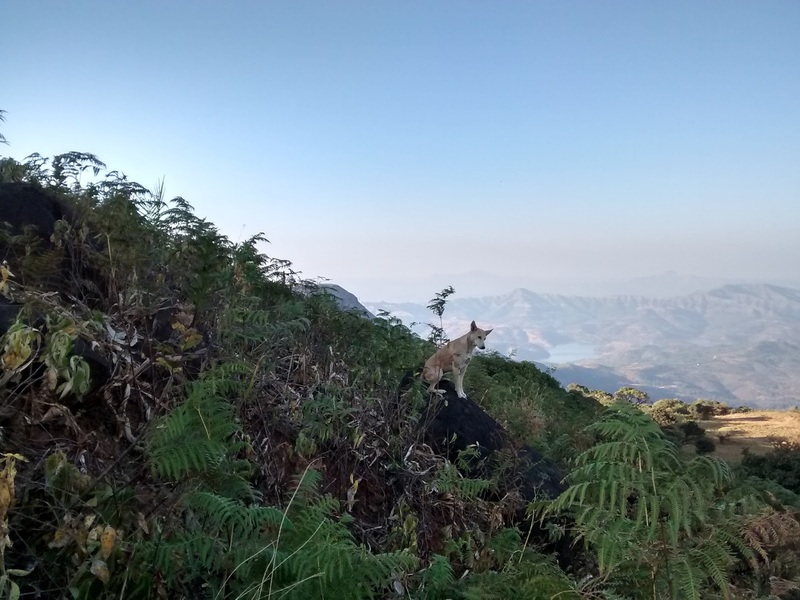 All I had to do was to enjoy the beauty of Sahyadri and click photos. We walked on and on… This time it wasn’t much difficult. There were no fog, no clouds and the Karvi was drying fast. It made our route much simpler than last time. Like previous time, this time as well, we were carrying enough food and water for three of us. We were well equipped I would say. Koleshwar Plateau on opposite side of valley looked gorgeous. Now, we moved ahead and some trails were available. 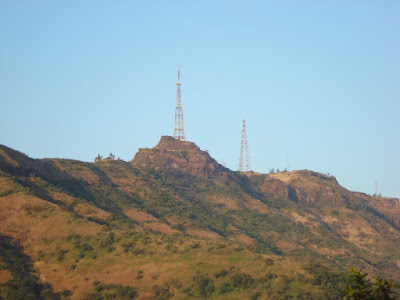 Kenjalgad and Kamalgad were very easily visible. It was 1130, when Sagar showed us a mile stone, It read Nakhind 7 kms. It felt like an achievement then. We decided to take a quick break. And suddenly, Sagar pointed behind me. 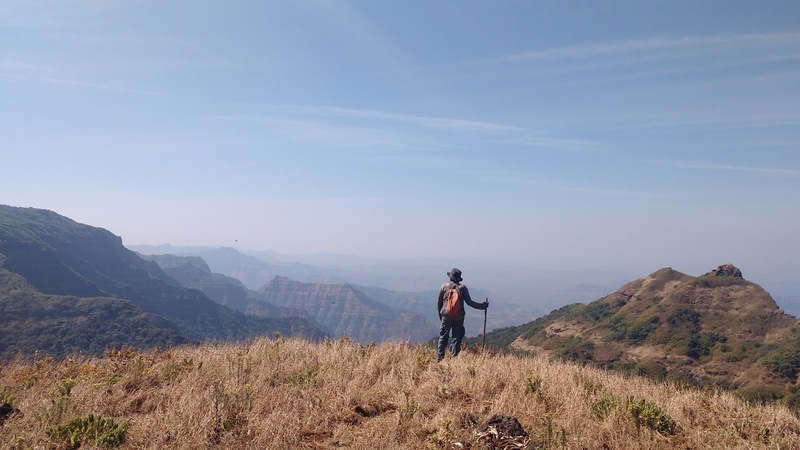 I was extremely happy to see my second home – Rajgad. 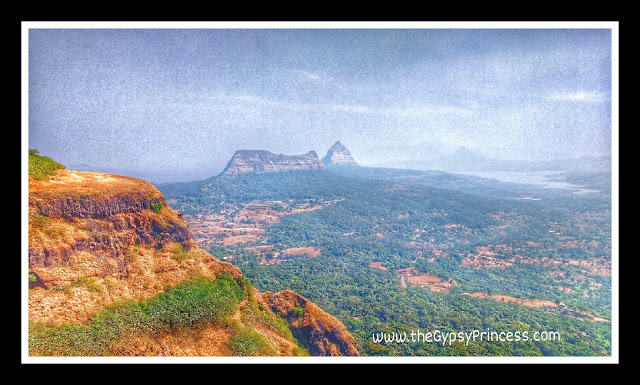 Then Torna, then Prasad pointed towards Raigad, the Varandha ghat section, Mohangad, Mangalgad… OMG. That place was just awesome. We rushed towards another end of plateau to have a better look. Kudali village could be seen. Prasad has great hold of Geography. At 1230 we were near a waterhole, so decided to take a quick pitstop to refill our bottles and eat Thalipith. The day went on so did we. At about 1300, we reached near an end of the plateau and Nakhind was visible. But the trail was missing. There was a dried waterfall which was surrounded by a forest. We decided to climb up the waterfall and we entered the forest. This was a thick forest and this time it was not karvy. At places we had to crawl below trees. The trees had inch long thorns. I suggested Prasad to climb up a tree and check where we needed to head. He tried that twice. The first tree wasn’t much tall but second tree that we found later was much taller. He said we needed to head towards left towards a hillock and he also estimated that we would take about 30 minutes. And in exact 30 minutes we were on that hillock. There was a light trail heading towards Nakhind’s GPS position. We followed this trail and which led us to another side of the cliff we had encountered before entering the forest. We had lost a lot of energy and time fighting that forest. Hence, we decided to have lunch and return from this point as time was already 1515. Starting the return hike in about half hour would have awarded us enough daylight time to get back to the right trail and yet it would have been dark to reach Mama’s place. Lunch consisted of boiled eggs, bread, butter, jam etc. We rested for few minutes and started the return hike. In between Prasad kept tracking our GPS location. It was close to 1700 when we reached near the waterhole where we had our break earlier that day. We did not have to encounter the forest on our way back, so it was much comfortable walk. Near the sunset, we came across a man who was tending his cattle. Now the trail was available and it wasn’t much difficult but we had to develop our “nightvision”. At 1900, we were close to civilization yet decided to take a break. Sagar informed mama that we were on our way back. We fed biscuits to the dogs and had oranges for ourselves. Hats off to both the dogs! 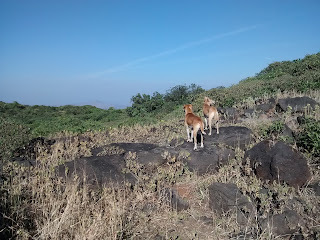 They both had walked entire distance with us plus more when they ran around chasing preys. It was around 1945 when we reached mama’s house. Mama was insisting that we should have dinner, but riding post dinner would have meant a sleepy ride so we asked of Limewater which was very refreshing. After having dinner at a hotel on NH4, we returned to Pune at 0030.